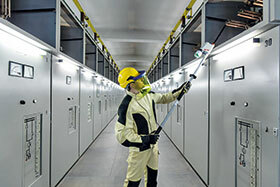 DEHN Africa has introduced the new PHE4 series of voltage detectors to improve safety during maintenance of electrical systems and installations. The detectors provide reliable information in all weather conditions – wet and dry – and can be used both indoors and outdoors. The voltage detector series verifies the presence/absence of voltage on every electrical pole that has been installed from 1 kV to 420 kV. A test function allows the required functional testing to be performed before and after using the voltage detector. All the live parts are tested – from the indicator right up to the test probe. In addition, the control panel is large enough to operate the device while using protective gloves. After conducting the functional test, the voltage detector remains operational for four minutes. Both a visual indication and an acoustic signal indicate whether voltage is present or not. If a larger distance is required to ensure safety, or if the length is not sufficient to reach the point of contact, an extension handle can be attached through the coupling system by DEHN Africa. Fuel cell system helps channel electricity to rural community.